509 libraries (436 buildings and 73 mobiles) currently under threat or closed/left council control since 1/4/11 out of c.4517 in the UK. See link on right for full tally. Roy Clare, ex-Rear Admiral and currently head of the MLA (Museums, Libraries and Archives Council), recently best known for (a) defending library closures, (b) deriding library campaigners as “white and middle class” and (c) issuing an apology to a nine-year old girl he had made disparaging comments about in a widely shared email, has announced he is moving to New Zealand, leaving his post in May. One of the major suppliers of books to libraries in the UK has announced profits have been hit by a 25% reduction in business from public libraries. Twenty. Five. Percent. That’s before the cuts this year have even taken effect. Weirdly, at the same time, anti-public libraries spokesmen like Toby Young point to a decline in library use. The Private Eye, in it’s excellent “Library News” column, points out that there just might be a causal connection between reducing funding to libraries and reducing use. Clearly the people of Portishead think that properly funded libraries are worth going to – their new library opened yesterday with a queue outside. Nor does there need to be a new library involved as Hillingdon’s record use has demonstrated. The money also needs to spent properly and sometimes councils are their own worst enemy in this, as the £289k in public relations to go on the £189m Library of Birmingham show. There is a third way between closing libraries and letting them out to volunteers. Fund and manage them properly then the people will come. Even more than the 320 million who did last year. Bertrams blames sales drop on libraries decline – BookSeller. Library sales down 25%. Library News – Private Eye (content not available online). The 3% drop in number of people using libraries since 2006 was used by Toby Young to claim libraries are becoming less popular but the real reason is lack of investment and closing them. Brent’s idea of a “virtual” library service to replace six closed libraries also noted with wry disapproval. Campaigners say publishers are “not interested” in library fight – BookSeller “We’ll see 500 [go] this year, and we’ll see another 1,000 next year once councils see they can get away with it.” (Tim Coats). The comments section is very interesting with one publisher saying the library sector has already been discounted by publishers (enlighteningly going on to say that “Publishers would show interest again if that was co- ordinated library policy”) and others expressing shock and horror at him, saying libraries are more than worth fighting for. Ends – Good Library Blog. Roy Clare, head of the MLA, to leave in May. London Book Fair: Libraries must digitise to stay relevant – BookSeller. Recommends that libraries, especially research libraries, digitise unique content as a way of boosting physical footfall to that material not yet digitised. News from CILIP April 2011 – CILIP. Items include – Vote Local Vote Libraries, Open Letter to Michael Gove, training courses and blogs. No furniture so charming – London Word Festival. “A night devoted to the architecture of knowledge and the future of book-borrowing” at Bethnal Green Library, 21st April. Tom Roper wonders why there appears to be no public librarians on the panel. Birmingham – Chutzpah is getting a little pricey – Alan Gibbons. Council is apparently paying a PR firm £292k over three years to provide public relations support for the £189m Library of Birmingham project. Brent – Campaigners to present petition tonight for debate on Preston Library – Harrow Times. 6500 signature petition to force council debate. ““I think the consultation period was a sham as it presented it as a transformation project rather than highlighting the potential closures that would actually come out of it”. Buckinghamshire – Council responds to fears over Micklefield and Bourne End libraries – Bucks Free Press. A careful reading of this article (and comments) show that Buckinghamshire Council are not guaranteeing council control after the end of this financial year. Dorset – Lyme Regis: Lyme treated “unfairly” in library cuts – View Online. Lyme Regis would only retain library if the town council pays for and manages it Dorchester retains full library without any additional payment. Gloucestershire – Lib Dem [Equalities] minister [Lynne Featherstone] says Brockworth library has bright future – This is Gloucestershire. Recently refurbished library no longer being run by the council is a good thing as “it can become a thing which is not statutory, not just already there, but it’s there because people want it and people are prepared to run it”. Gloucestershire – When is a library not a library? – FoGL. When it’s a mobile. 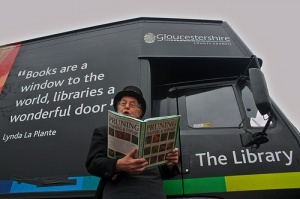 Gloucestershire Council claim no libraries need close, neglecting to mention its doomed five mobile libraries. Lewisham – Lewisham’s library bidders meet the public – News Shopper – Breakdown of the four organisations who want to take over one or all of the closing libraries – (a) Lewisham Community Sports, (b) Eco Computer Systems, (b) Omega (New Testament Church of God) and (d) Family Services charity. Surrey – Large turn-out from Stoneleigh library supporters – This is Local London. 120 at meeting to oppose closure. Warwickshire – WCC Libraries business case application form: a Dragon’s Den pitch? – What’s In Kenilworth. “So, what happens if take the dry throated walk up the stairs and make your pitch? You know you are holding the fate of your Community Library with you as you begin. The threat of closure looms over your village and this is the Once in a Lifetime Opportunity that Warwickshire County Council have promised….”. Requirements include three-year financial projection. Print article This entry was posted by Ian Anstice on April 13, 2011 at 9:24 pm, and is filed under Uncategorized. Follow any responses to this post through RSS 2.0. You can skip to the end and leave a response. Pinging is currently not allowed.